Unions are a part of our modern life. What does the Bible teach about them? Are they legitimate? What is the Christian response? We need to start with work. God is a worker. He designed us to be workers. It is God's desire that we all work. Unions have come in to organize the workers to achieve certain goals. Some companies have abused their employees and unions have stood up for the helpless. In a sinful world there will always be abuses, but the question is: How does God expect us to handle abuses? Are Unions the correct response? Whose responsibility is it to handle workplace abuses? We will Scripturally answer these questions. How Does God Expect Us To Handle Abuses In The Workplace? We must distinguish between real abuse and differences of opinion. Real abuse involves things like sexual harassment, unsafe working conditions, force or violence, violating agreements, etc. In short, it is Biblically-defined criminal activity against employees [or employers]. Differences of opinion include things like hours of work, pay rate, vacation time, promotions, benefits, etc. How Do We Handle Real Abuse? We can report the abuse to the police or those in authority. It is also possible in some cases to bring a civil law suit. In God's system, a Godly society handles real abuses through the court system according to Biblical Law. The Biblical justice system is to protect both the employers and the employees from evil actions. Now we know we do not live in Godly countries. We cannot depend on the courts to give fair decisions. What are we to do? Since we are dealing with Biblically-defined crimes, we have to see if the court system is an option. For example, sexual harassment may be able to be handled in court while unsafe job conditions may not be. We have to assess the individual situation. If both the employer and the employee are Christians, both should study the Word of God about their OWN responsibilities [not the other persons]. If they cannot come to an agreement then the matter is to be brought before a church council which is committed to Biblical Law and whom both can trust. They need to be willing to live with the decision. In cases of real abuse, we have to look at all legitimate options: the courts, the church, resigning, or going to the union. 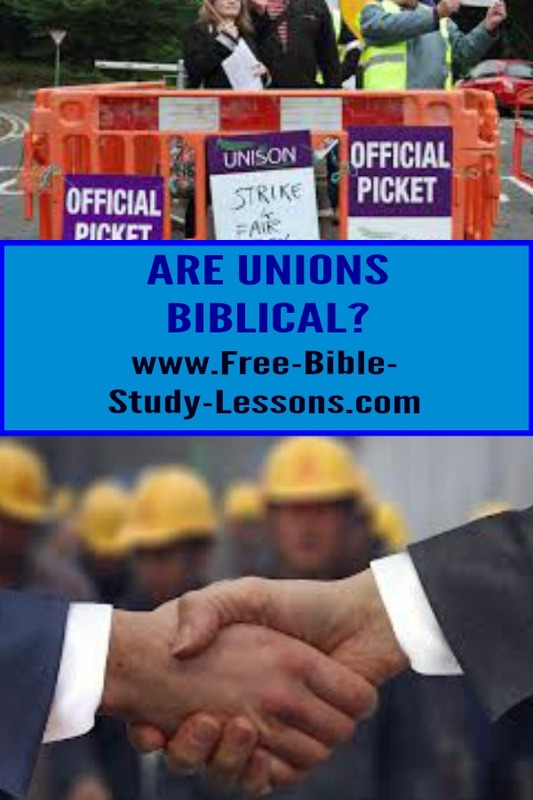 In a society where the courts cannot be depended on to provide God's justice, then a union may offer some protection, although they often do not operate on Biblical principles any more than the courts do. What if we don't think we are being paid enough? What if we don't like our hours of work? What if we want more vacation time? What if we want more benefits? What about all these and other things? Jesus told a very instructive story on these issues. One which many people wish He had forgotten! For the kingdom of heaven is like unto a man that is an householder, which went out early in the morning to hire labourers into his vineyard. And when he had agreed with the labourers for a penny a day, he sent them into his vineyard. And he went out about the third hour, and saw others standing idle in the marketplace, And said unto them; Go ye also into the vineyard, and whatsoever is right I will give you. And they went their way. Again he went out about the sixth and ninth hour, and did likewise. And about the eleventh hour he went out, and found others standing idle, and saith unto them, Why stand ye here all the day idle? They say unto him, Because no man hath hired us. He saith unto them, Go ye also into the vineyard; and whatsoever is right, that shall ye receive. The employer reached a mutually agreeable contract with his first employees. They all agreed that this was a fair price for the day's work and then they went to work. The employer did not force the people to work for him. The employees did not have to agree to his offer. But both sides agreed. The contract was established. The employer would provide the agreed on wage and the employee would provide the agreed on labour. The employer hired other employees during the day. He made no promise of what the wage would be, but the employees were willing to work under those conditions. They did not have to, but they trusted that it would be worth their time. At the end of the day, the employer gave to everyone the same wage. Those hired first - like good humanists - thought this was unfair. The employer pointed out that he had faithfully fulfilled his contract to them - which they had both agreed was fair - and they had no right to tell him how he would spend the rest of his money. As long as the contract to them was fulfilled, it was none of their business what he did to others. Jesus makes plain that the employee has the right to whatever was promised in a mutually agreed upon contract, but has no further rights on the employer's time, money, or property. Neither the employer nor the employee is to try to force the other into a contract against their will. It must be freely entered into on both sides. If the employer forces the employee to work for wages and/or benefits below what they are willing to, then that is oppression by slavery. If the employee - often through unions - forces the employer to pay more in wages and/or benefits than he is willing to, then that is oppression by extortion. If there is no mutually agreeable contract then the employees are free to seek other employers who more closely match their desires or even start their own businesses, and the employer is free to seek other employees who are willing to accept lower wages and/or benefits. Unions may represent a group of employees and negotiate a contract with an employer to their mutual benefit. However, if the union uses tactics to try and force an employer to give more than he is willing to give then we have a sinful, unBiblical, oppressive situation. No Christian should support such activity which is actually criminal extortion. This means that strikes are totally wrong. No Christians should ever vote for a strike for any reason. Any job action designed to hurt the employer's business or force him in a contract against his will is sin. If employees feel they cannot work under the conditions offered, they have the right to quit - all at once if they wish. However, they cannot complain if the employer finds other employees who are willing to work under his conditions. The employer is in charge of his business as long as he is not violating a mutually agreed upon contract or the limits of Biblical Law. This means that unions have no right to try to control any aspect of the employer's actions as long as they are not criminal or contract violations. The employer has the right to promote whomever he wishes regardless of seniority. If the employer wants to give someone a raise or a bonus above the contract wage, that is his right. As long as he is not paying anyone below the contract rate there is no problem. Employees and Unions often feel they have a right to their jobs. This is a misconception. A job is a position of mutual benefit. The employer desires the labour of the employee more than the money/benefits paid to the employee. The employee desires the money/benefits more than his time. If there is no contract then either party has the right to end the relationship with proper notice [traditionally two weeks]. The employee can quit. The employer can end the job position or fill it with someone else. If there is a contract, then both parties must live by the terms of the contract. When the contract ends, both are free to make their decision. No one has a lifetime right to a job. A job is only valid as long as it is mutually beneficial. Most - if not all labour Unions - are closed ship Unions. This means that in order to work for a given employer a person must belong to a Union. No where in the Bible is permission given for one person to force another person into any kind of relationship. Closed shop Unions are based on extortion, fear, and violence or the threat of violence - "You have to pay us or we won't let you have a job!" The only legitimate Unions are voluntary associations which restrict their activities to protecting their members from real abuses and negotiating mutually beneficial contracts. They could also provide training, education, job placement, social activities, etc. for their members and/or families. This way Unions have to earn their membership. They have to convince workers that the benefits they provide are worth more than the dues they charge. If they fail to live up to their promises, then they lose members.